Students in Southern Illinois University Edwardsville East St. Louis Center’s Project Success program eagerly work on their pieces of fabric. Some are cutting the outlines of their hands, while others are helping secure the shapes on the fabric. Sewing all the pieces together in a quilt will be Edna Patterson Petty of East St. Louis, noted multimedia and fabric artist and art therapist. Petty earned a bachelor’s of art and design in 1984 a master’s in art therapy in 1988, both from SIUE. 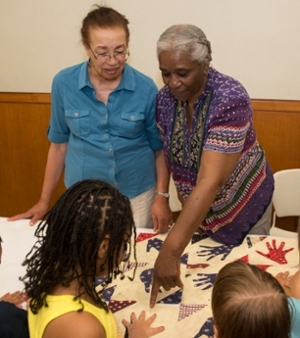 Approximately 58 children have been working with Petty and other local quilters for several weeks to construct the red, white and blue quilt, “Celebrating the U.S.A.” The finished product will be displayed in the SIUE East St. Louis Center Director’s Office. The East St. Louis Greater Community Fund secured the grant for the activity. 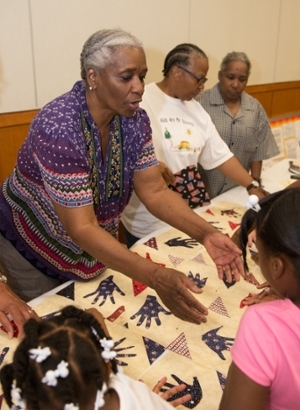 Pam Coaxum, executive director of the East St. Louis Greater Community Fund, presented several homemade quilts to the children. One quilt that Coaxum made contained various African symbols. The process of making the quilt is also important, Petty said. “Artwork is therapeutic,” she continued. “I never tell the children we are doing art therapy. I talk to them and try to make them feel better. I let them all know that they have something valuable to contribute. The Project Success Program is a comprehensive after-school tutorial enrichment child care program which services children 5-14 years of age. The program is funded by the Illinois Department of Children and Family Services. It is designed to serve children who are in protective custody and are referred by the Department of Children and Family Services caseworkers. The program provides services to children living within the St. Clair County area. Helping students arrange their patches are local quilter Hattie Thompson (left) and Project Success teacher Rosalind Wells. 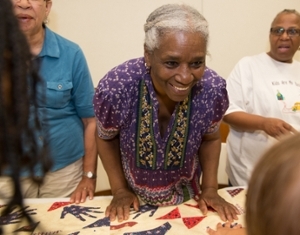 Reaching out to one student is multimedia and fabric artist and art therapist Edna Patterson Petty. Also assisting are teacher Rosalind Wells (center) and Project Success childcare assistant Sandra Patterson (right). 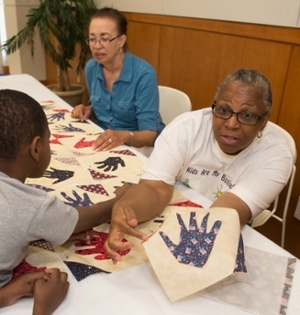 Edna Patterson Petty, multimedia and fabric artist and art therapist, loves to engage children in artwork. Local quilter Hattie Thompson (left) and Patterson Petty remark about the children’s handiwork.